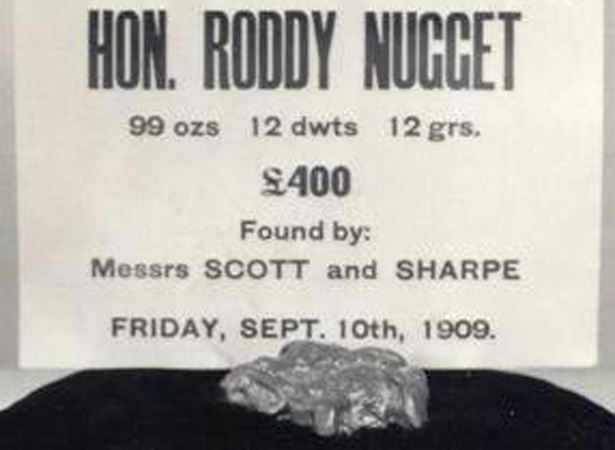 ‘Messrs Scott and Sharpe’ found the heaviest gold nugget on record in New Zealand at Ross on the West Coast in 1909. Weighing in at 3.09 kg (99.63 ounces), it was named the ‘Honourable Roddy’ after the minister of mines, Roderick McKenzie. The nugget was bought for £400 (equivalent to $67,000 in 2017) by a Ross storekeeper and his Canterbury associate. A cast of it was soon on show in the Canterbury Museum. In 1911 the ‘Honourable Roddy’ was bought by the government. Mounted in a ‘fitting setting’, it became New Zealand’s ‘decidedly handsome’ Coronation gift to King George V. When enquiries were made 40 years later, it was discovered that the nugget had been melted down to make a royal tea service. Impressive as the Honourable Roddy was, it was tiny in comparison with the world’s largest gold nugget, the ‘Welcome Stranger’, found at Moliagul, Victoria, Australia, in 1869. John Deason and Richard Oates’ discovery weighed a staggering 71 kg. In mid-2017 gold was selling for about NZ$1700 an ounce, so the Honourable Roddy would have been worth about $170,000. We have 2 articles, related to New Zealand's heaviest gold nugget discovered .